One night about two months ago, I was out at a bar with a couple friends. The blog was in its nascent stages, and I was running out of ideas (this is what happens when you start a Nets blog with 12 games to go in the season). Fortunately, my friend Steve of Fluxing Philosophic fame, pointed out a blurb about a documentary called Gotta Dance. Both he and I read the blurb a little too fast, and believed it to be a documentary about the Nets cheerleaders. Yes, I can definitely get behind watching beautiful women in form fitting outfits dance for 90 minutes. 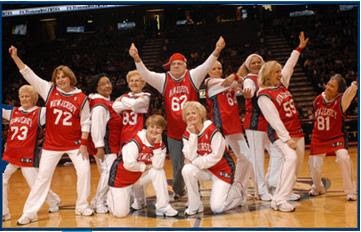 However, my friend Danny (of Danny Thoughts fame), pointed out the key word we missed: the Nets SENIOR Dance Team. Cue up the sad trombone. After getting over this initial flub, I figured that the concept was very unique and related to the "peripheral" world of Nets basketball that is was worth exploring. Having seen the film, I can say that it was a good decision. The main theme of this film is in the quote above (which begins the film) - that age is all mental, and you can still have fun throughout your life. I'm sure as reviews pour in for this film, they will all mention that similar sentiment, so I do not want to spend an inordinate amount of time on it. 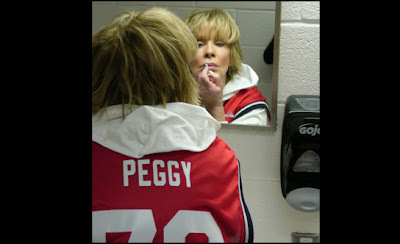 Plus, pulling from my own life experience, I already knew that older people can still rock it. For example, my parents got divorced when I was 14 years old. Although my mom was 46 and now raising two sons by herself, she still went out to singles functions to meet new people her age, and had a significantly better dating life than I did! As embarrassing as it is to admit, it is still somewhat difficult for me to keep track of where she is at times - as she spends many weekends traveling or weeknights at the movies or with friends she met at the local Starbucks. It is difficult to imagine her slowing down as she hits her "golden years" of 65 and older. To make a tired point - and summarize the theme of the movie - age does not slow you down, it is just one more roadblock in a life full of roadblocks. With hard work and determination, anybody can blow through it. But, there is so much more I took from this movie than the "age is nothing" theme. One thing that really struck me was how much work is put into creating the team. The movie chronicles a try-out and selection process, followed by two weeks of intensive training. All of this leads to a two-minute dance routine in the middle of a 150 minute basketball game. It seems like a lot of work for a little reward, but it pays off with fame, as the team gets noticed by major newspapers and performs on TV morning shows. But, immediately after this, it is on to learn a new routine. I usually mock the Nets' slogan "More Than A Game", but this movie actually made me believe that. To draw from my own personal life again (yeah, don't worry, I'll continue talking about the movie - but this is MY blog, suckas), my aforementioned friend Steve took his girlfriend Lisa to a Nets game this season - his first game in a long time, her first game ever. And the Nets got crushed. I felt bad for them because they were subjected to such a horrible game. However, after seeing this movie, I can appreciate the hard work the other performers (besides the main attraction) put into creating an all-around entertainment experience. Hopefully, they will feel the same way after seeing this film and choose to go to another game. Unfortunately, I am extremely superstitious and will do everything in my power to prevent them from stepping through the front gates again. The thing that will last with me about this film is the attention it pays to detailing each person in the film. While the bird's eye view of the movie is the "age is nothing", when you dig deeper, you can see all the persons motivations for dancing. 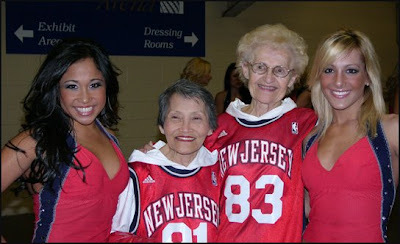 Two of the Dancers are the grandmothers of the NETSational "younger" cheerleaders. The dancing not only is to feel young and meet new friends, but to have a unique bonding experience with their granddaughters. There are two other personalities that got a lot of screen-time that were very fascinating. One is Betty...or should I say...Betsy. She explains the duality of her personalities. Betty is the reserved, conservative school teacher who likes to remain traditional - she even wears flats so that she does not appear taller than men. 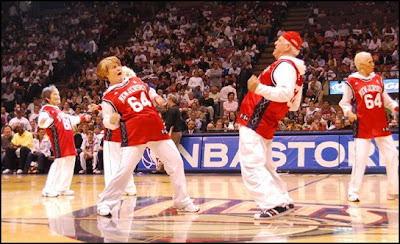 But Betsy is the wild, fashion-savvy hip-hopper, who rose to the rank of leader of the Nets Senior Dance Team. This arthritic version of Jeckyl-and-Hyde illustrated the difficulties we all face of breaking out of our normal, comfortable life to challenge ourselves. Trying something new can lead to failure, and failure can be devastating. Eventually, Betsy's confidence influenced Betty's life, and she became more outgoing and creative in her teaching, introducing hip-hop into the classroom. Another dancer I enjoyed learning about was Peggy, pictured above. As a young woman, she was "Miss Subway", with her face on posters. Clearly, she was a looker back in her youth, and still adores the attention. Her age has not diminished her confidence, as she feels she is still a stunner. The way she talks is interesting too. I could easily characterize the other dancers, as they all sounded like my parents or grandparents - making corny jokes or being very polite. However, with Peggy, the manner-of-fact way she talked made her just sound very young. To be fair, there are a couple of downsides. I would have loved to see more Dancers explored. Granted, there are 13 dancers, which is a lot for one film, but there were many training scenes that could have been shortened. Also, while most of the dialogue seemed authentic, there were a couple of moments (i.e. in the dinner scenes) where it seemed a little set-up - but I expect this of many documentaries. Overall, it is definitely a film that Nets fans should check out - it will definitely give you more insight into the behind-the-scenes of the Izod Center entertainment. Documentary fans will not be disappointed, either. There is no heavy-handed political commentary (a la Michael Moore) or personality distortions to create conflict (a la The King of Kong, which is still really good and I do recommend). There are some excellent character studies and a solid, well-built theme that reaches a satisfying conclusion. Click here to see a list of upcoming screenings of Gotta Dance.